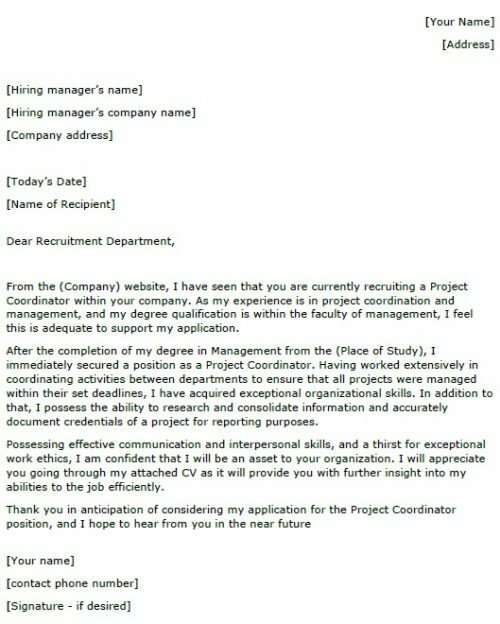 Use this cover letter sample if you are going to apply for a Project Coordinator job. You should amend this covering letter as suitable before sending it to the employers. From the (Company) website, I have seen that you are currently recruiting a Project Coordinator within your company. As my experience is in project coordination and management, and my degree qualification is within the faculty of management, I feel this is adequate to support my application. After the completion of my degree in Management from the (Place of Study), I immediately secured a position as a Project Coordinator. Having worked extensively in coordinating activities between departments to ensure that all projects were managed within their set deadlines, I have acquired exceptional organizational skills. In addition to that, I possess the ability to research and consolidate information and accurately document credentials of a project for reporting purposes. Possessing effective communication and interpersonal skills, and a thirst for exceptional work ethics, I am confident that I will be an asset to your organization. I will appreciate you going through my attached CV as it will provide you with further insight into my abilities to the job efficiently.